A mechanic's lien is a security interest in the title to property for the benefit of those who have supplied labor or materials that improve the property. In terms of real property, a mechanic's lien is also known as a construction lien. It is also called a materialman's lien or supplier's lien when referring to those supplying materials, a laborer's lien when referring to those supplying labor, and a design professional's lien when referring to architects or designers who contribute to a work of improvement. 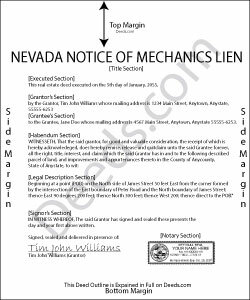 Under Nevada law, in order to ensure payment for services and to protect the rights of a contractor, subcontractor, or material supplier, a mechanic's lien can be filed against a homeowner's property. The lien creates a legal method for these contractors, subcontractors and suppliers to foreclose on the improved property, in turn forcing a sale of the property in order to obtain payment for their work or materials. In Nevada, mechanic's liens are governed under Chapter 108 of Nevada Revised Statutes. Any person who provides labor, materials, or equipment valued at $500 or more which is used in the construction, alteration, or repair of property is entitled to a mechanic's lien. However, if a license is required to perform the work in question, the contractor or professional can only file a lien if he or she is licensed to perform the work. A mechanic's lien is available when labor, services, or equipment, and/or materials have been provided; labor was performed; materials were intended for and used on the property; permanent work or improvement was performed; and the work was performed with the consent of the owner or his or her agent. Property subject to a mechanic's lien includes any property in which any improvements including work, materials, and equipment have been furnished and any construction disbursement account (NRS 108.222(1)). The definition of property includes the land and all buildings, improvements and fixtures, and any convenient space around the land. Improvements are defined as any development, enhancement, or addition to the real property. A single lien can be recorded against several buildings when there are multiple parcels or buildings. However, lien claimants should be cautious because a failure to allocate a lienable amount (unpaid debt) among several buildings can result in the subordination of the lien to a lien subsequently recorded (NRS 108.231(5)). The lienholder is entitled to either the contract price in which case the lien is equal to the unpaid balance or the agreed upon price (NRS 108.221(1)(a)) or if no agreement has been made on a specific price, the fair market value of the work, materials, or services provided (NRS 108.222(1)(b)). The order in which lienholders are entitled to collect on a lien is governed by rules of priority. A lienholder who provided labor is given first priority, followed by material suppliers and lessors of equipment, then other lien claimants who performed under contract with the prime contractor or sub-contractor, and all other lien claimants are given last priority. A lien must be perfected in order to achieve priority over unperfected or later perfected liens. To perfect a mechanic's lien, the first step is to provide pre-lien notice in the form of a notice of right to lien. Under NRS 108.245(1), a lien claimant may provide notice at any time after the first delivery of materials or performance or work or services under his or her contract. Although no time frame is provided, a lien claimant should record this notice promptly. The purpose of recording is to provide warning to the owner of the property that the lien claimant may at a future date record a lien on the property. This required notice does not, however, create a lien (NRS 108.245(B)). Notice must be delivered in person or through certified mail to the owner (NRS 108.245(1)). Sub-contractors must also give notice to the prime contractor in person or by certified mail. Failure to provide such notification is grounds for disciplinary action against the sub-contractor by the State Contractor's Board. There is an exception to this rule for sub-contractors who provide labor only. Additional notice is required for all residential construction projects. If the work includes construction, alteration, or repair of a multi-family or single family residence, including without limitation, apartment houses, then the lien claimant (party to the construction contract other than the owner who is seeking payment) must also serve a 15-day notice of intent to lien. The notice of intent to lien is not required to be recorded although it must be served personally or by certified mail (NRS 108.226(6)). The owner and the prime contractor must be served within 15 days of the notice of intent to lien as a statutory pre-requisite to the notice of lien filing. To actually create a lien, you must take the second step of filing, recording, and serving a notice of lien in order to perfect. Under NRS 108.226(5), the notice of lien must be completed in substantial accordance with the form set forth by statute and specify: 1) the total amount of the original contract, 2) the total amount of all work, materials, or equipment, 3) the total amount of all payments received to date, 4) the amount of the lien after subtracting all credits and offsets, 5) the name of the property owner, 6) the name of the person by whom the lien claimant was employed or to whom the lien claimant furnished or agreed to furnish work, materials, or equipment, 7) a brief statement of the terms of payment of the lien claimants contract, and 8) a description of the property to be charged with the lien. The notice of lien must contact a verification by oath of the lien claimant. The timing of the notice of lien is governed under NRS 108.226(1)(a) and (b) which states that the notice of lien must be recorded within 90 days after completion of the work or improvements or the last delivery of materials or the furnishing of equipment by the lien claimant, and must be served upon the owner of the property within 30 days after recording the notice of lien. The notice of lien must be served through delivering a copy to the owner personally, or if the owner is absent from the residence or place of business, a copy can be mailed through certified mail with return receipt to the owner at his residence, usual place of business, or through his or her resident agent. If the owner cannot be located and the owner's residence or place of business cannot be ascertained, service can be achieved by fixing a copy of the notice of lien in a conspicuous place (such as affixing to the main entrance door), delivering a copy to the person residing there, or mailing a copy addressed to the owner at the property address. All owners must be served with the notice of lien, but a failure to serve all owners will not invalidate the lien (NRS 108.227(2)). Additional caution should be exercised by sub-contractors as failure to deliver notice to a general contractor is a basis for disciplinary proceedings against a sub-contractor (NRS 108.256(4)). A mechanic's lien or construction lien is effective for six months after the recording date (NRS 108.233(1)) unless a lawsuit is commenced to enforce the lien or the time to commence a suit has been extended by written agreement, signed by both the lien claimant and the person with an interest in the subject property. The agreement to extend the time to foreclose is only effective if recorded in the county recording office prior to the expiration of six months and must be notarized. The agreement cannot exceed one year from the date of recording. A lien claimant must wait thirty days from the date of recording the notice of lien in order to initiate a foreclosure action (NRS 108.244). An action to foreclose on a lien may not be brought any later than six months after the lien was recorded unless the time has been extended by agreement. In order to foreclose, the following documents are required: 1) a complaint filed in a court of competent jurisdiction which should include additional contract-based causes of action, and 2) a notice of pendency which must be filed with the court and recorded to provide constructive notice to the work of an alleged claim or an interest in the property. The notice of foreclosure must be published once per week for three consecutive weeks in a newspaper published in the county where the property is located and must be delivered in person or by certified mail to all other lien claimants who have had liens recorded against the subject property at the time the complaint is filed. A lien claimant who receives a notice of foreclosure of another lien claimant's lien must file a statement of facts constituting lien with the court within a reasonable time after publication or receipt of the notice of foreclosure. Discuss any situation involving multiple lien claimants with a licensed and competent attorney. Under NRS 108.237, in addition to the claimed lien amount plus any costs for the preparation and recording of the notice of lien, the Court can award attorney's fees to the prevailing lien claimant. The court can also calculate and award interest either in accordance with the contract or legal rate of interest (3.5% as of January 1, 2016). In summary, mechanic's liens in Nevada are available for contractors, subcontractors, and material suppliers as a method to ensure payment for services or materials provided as long as the lien claimant complies with Nevada lien statute. However, as each case can be unique and set forth novel legal issues, it is important to seek legal consultation from a licensed Nevada attorney familiar with issues present in mechanic's liens.